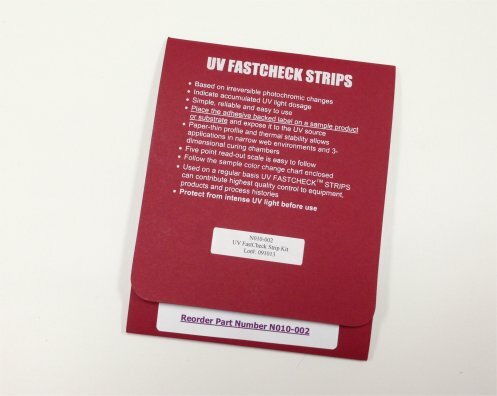 CON-TROL-CURE® UV FASTCHECK™ STRIPS are simple, reliable, and easy to use indicators of accumulated UV light dosage. They are the first product that can be used to determine levels of UV dose with a simple, visual inspection due to the 5 separate colour changing zones. Each of the 5 zones begin to change colour after a specific amount of UV dose has been received. First the "1" zone begins turning from yellow to blue. Then each subsequent colour zone starts to change colours when its specific chemistry has received the proper amount of UV to activate its colour change. The versatility of this unique UV measurement tool allows users to measure a significant range of UV doses. 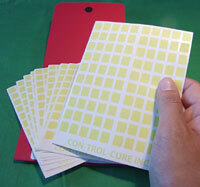 CON-TROL-CURE® UV FASTCHECK™ STRIPS measure UV doses from 0mJ/cm² to greater than 5,000mJ(5J)/cm². 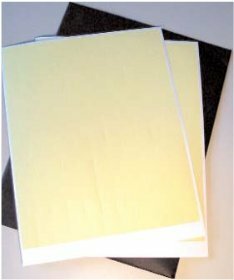 As well, due to their paper-thin profile and thermal stability, they can be used in all applications where a radiometer is not possible, including: Web printing, Sheet Fed printing, Exposure Verification of exposed products, 3-D curing, and personal UV exposure level testing. 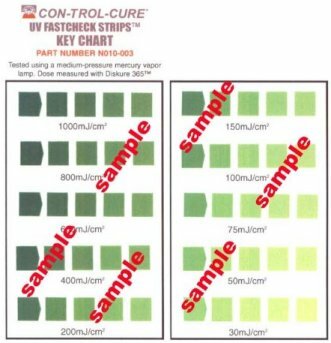 The CON-TROL-CURE® UV FASTCHECK™ STRIPS' clearly identifiable colour change enables users to visually differentiate the dose differences. To measure the dose even more precisely, use a spectrophotometer to record colour change by the CON-TROL-CURE® UV FASTCHECK™ STRIPS. NOTE: For best results, observe color change immediately after exposure to UV light as label may change. As well, a comparative dose chart for the CON-TROL-CURE® UV FASTCHECK™ STRIPS is included in each package. With this chart, each tested CON-TROL-CURE® UV FASTCHECK™ STRIP can be correlated to the millijoule range of UV energy that each colour pattern represents. Made from the same exclusive material, the New UV Intensity Labels™ (N010-005) have the same colour changing principle as the Strips, but they have only 1 color changing square. Click here for more information. • UV FastCheck™ Chart shows 10 steps at 30mJ, 50mJ, 75mJ, 100mJ, 150mJ 200mJ, 400mJ, 600mJ, 800mJ 1000mJ. Fastcheck strips normally available from stock. 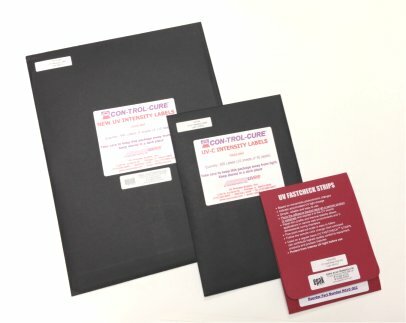 UV intensity Labels and UV Fastcheck Strips: Which one is right for me ?